Kleftiko means 'stolen' in Greece, and it refers to the days when bandits roamed the hills and if they managed to steal a goat or sheep, they would cook it in a hole in the ground so that no aroma, smoke or steam could escape to give away their location. Lamb kleftiko is cooked for several hours, until the meat is falling off the bone. It's really easy to make, and really tasty. Peel the onion, halve it and slice it. Top and tail the garlic cloves and crush them or cut them in half - leave the skin on. Peel the potatoes and cut into bite-size chunks. Chop the tomatoes small. Preheat your oven to 180°C (356°F) for a fan/convection oven, or 200°C (392°F), gas mark 6. Pour a good glug of olive oil into an ovenproof dish (or crockpot if you're using a slow-cooker). Add rosemary leaves, oregano and ground black pepper. Roll the shanks in this to get them coated with oil and herbs. Surround the meat with potatoes, press the tomatoes on top of the meat, and layer the whole thing with onion. Squeeze the lemon over it, chop the peel into small bits and put them in the pot. Pour over the wine. Top with more rosemary and black pepper, and another glug of oil. Wrap the entire pot in 2-3 layers of aluminium foil - the idea is to seal the package so that no steam can escape. Bake for 4-5 hours. Enjoy with Greek salad and/or tsatziki. The video above is from the Keef Cooks YouTube channel. Click here to see the video recipe of Lamb Kleftiko on YouTube. Salt and ground black pepper to taste. 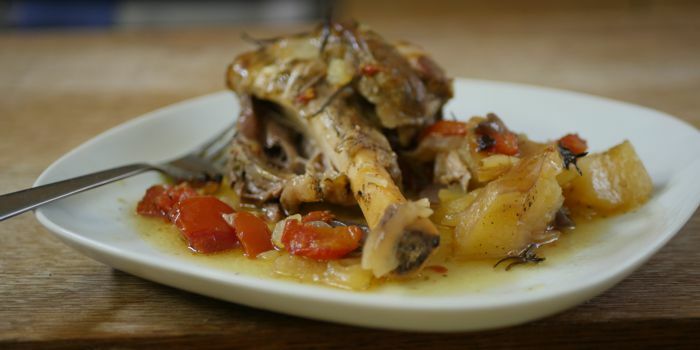 Lamb shanks or shoulder are best for this dish - they really benefit from the loooong cooking time. Leg of lamb is okay, but wouldn't be quite as unctuous. Total time: 4 hours 10 minutes.